Happy Gummy Holidays to our friends around the world, sending Gummy Christmas cheer to every boy and every girl! Hello Asia, Australia, and the America's two, we thank your hearts for shining bright, in all that you do. Greetings Europe and Africa with shared smiles of joy, thanks for heartfelt love, for every girl and every boy. 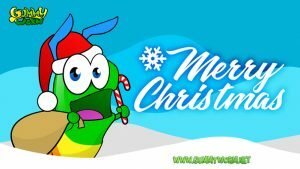 Thank you all for being kind, as we live together and learn, and Merry Christmas to you all, from Gummyland and Gummy Worm! Share this Christmas eCard with your friends!